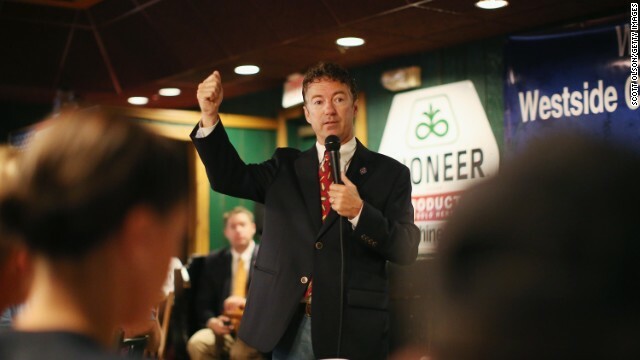 Urbandale, Iowa (CNN) – Asked whether he would support a constitutional amendment defining marriage as a union between a man and a woman, Sen. Rand Paul said Wednesday he supports the idea of traditional marriage but thinks Washington shouldn’t be involved in the issue. “And the loss of the idea of marriage is probably the leading cause of poverty in our country, in the sense that if you kids before you’re married, your chance of being in poverty is three of four times that of anyone else,” he continued. Paul’s comments came as he was taking questions at a breakfast event hosted by a conservative club in the Des Moines area, one of his final stops on a three-day trip across the state that holds the country’s first caucuses in presidential election years. At his events, he has focused on fiscal issues, minority outreach, privacy rights, foreign policy and immigration, largely staying away from social issues like marriage, birth control and abortion. In tune with his libertarian leanings, Paul reiterated that he supports the idea of removing the federal government from marriage. Taking a question on the Democratic-fueled argument that the GOP is behind a “war on women,” Paul said the recent debate over contraception has been misconstrued. He said the recent Supreme Court ruling-which decided certain for-profit companies can’t be required to pay for specific types of contraceptives for their employee-was more about religious rights than birth control. “They concocted this whole thing in some Madison Avenue advertising agency that there’s a war on women and I kind of jokingly say, ‘yeah, if there was, women won,’” he said. The Democratic National Committee quickly pounced on Paul’s remarks as “disingenuous” and “false.” The group pointed to legislation Paul introduced last year that would constitutionally define life as beginning at conception. Critics of such "personhood" legislation argue it could lead to bans of certain forms of birth control, like emergency contraception and intrauterine devices, that could potentially have effects after fertilization. “Female voters in Iowa, and across the country know where he stands – and it’s not on the side of women,” Rebecca Chalif, DNC deputy press secretary, said in a statement. Did he also talk about the one bite of burger he took before fleeing the scene when he saw Steve King being confronted by that Hispanic lady? "“And the loss of the idea of marriage is probably the leading cause of poverty in our country, in the sense that if you kids before you’re married, your chance of being in poverty is three of four times that of anyone else,”"
Let him talk. He's just creating more cannon fodder against himself. He will be confronted on his change of tone, but not his voting record. Did anyone see him do the "bite and run" yesterday? He bit that sandwich, grabbed his bottled beverage and was GONE, like a pheasant through the corn. "Rand Paul talks marriage, contraception in Iowa"
"and I kind of jokingly say, ‘yeah, if there was, women won,’” he said." Credit where it's due: that was a worthy semantic game to attempt. Flip-it-around is fair play. Problem is, what he just said really just functions as proof to most women that he's clueless about them, their issues and what it feels like to be a woman in 'Murkin society. “They concocted this whole thing in some Madison Avenue advertising agency that there’s a war on women and I kind of jokingly say, ‘yeah, if there was, women won,’” he said." Yes, well .... condescension might be worth a few laughs, but when it comes to votes? Not so much. I don't think it was about religious rights at all. I think it was more about setting a precedent that corporations have the same "rights" as people. How long do you think that it's going to take before "corporate people" start asserting their "right" to vote? This is the inevitable conclusion at the end of this road. The way I see it, though, if a company has "limited liability", then they should also have "limited rights." "Problem is, what he just said really just functions as proof to most women that he's clueless about them, their issues and what it feels like to be a woman in 'Murkin society." Listening ears, Sniffit. It's all about listening first and reacting accordingly. None of the GOP hopefuls are attuned to listening. They hear; but they do not understand. Nor, I think, will they ever. It would take too much effort for them to drag themselves away from themselves long enough to concentrate on others; if even for a moment. 7 BILLION PEOPLE ON THE PLANET . Lets Talk Birth Control ! Refuges wanting to migrate anywhere besides China and Russia . I happen to think rand paul is right on that point. At least, with the word 'have' thrown in before 'kids'. @ murcan how sick to call america that very sad lot . ""Problem is, what he just said really just functions as proof to most women that he's clueless about them, their issues and what it feels like to be a woman in 'Murkin society." Listening ears, Sniffit. It's all about listening first and reacting accordingly. None of the GOP hopefuls are attuned to listening. They hear; but they do not understand. Nor, I think, will they ever. It would take too much effort for them to drag themselves away from themselves long enough to concentrate on others; if even for a moment." Indeed. I think at least part of it is explained with all the psychological studies done on the differences between folks who identify as liberals or conservatives. The rigidity and dogmatic adherence to belief that marks conservatives very much contributes to a refusal or inability...and perhaps it's even somewhat unintentional...to hear things that aren't what they want to hear, that are contradictory to the dogmatically believed belief. It's why you can't have an argument with them in the realm of facts, why they spend so much time, money and effort on rewriting history and, when it comes to minorities, women and the LGBT community, why they so fervently and readily convinced themselves that their problems is not what they're trying to sell those communities, but rather just how they're trying to sell it. I happen to think rand paul is right on that point. At least, with the word 'have' thrown in before 'kids'." Those studies show correlation, not causation. People who grow up poor in rural 'Murika or in the inner city tend to have children much earlier in the first place, tend to have more children out of wedlock, tend to be less educated and a whole host of other factors. The idea that having children early and out of wedlock LEADS to poverty later in life is patently absurd in the face of the evidence that there's a cycle taking place and you simply can't say which came first or caused the other.
" our founding fathers didn’t register their marriage in Washington "
Is he against the Federal tax subsidy for marriage? That subsidy is supposed to support the traditional idea of marriage, in that it lowers the tax burden for a couple when one spouse makes much more that the other, as in a stay-at-home mom ( or dad?). I bet he back-tracks on that soon. Here is an idea. Leave people alone and let them marry who they want. As for contraception, well that is no ones business but your own. As for companies providing it, since it falls under a health issue it should be covered under insurance – regardless. We already have enough people in the world, really. How about large companies start paying livable wages to everyone and not just the top 1% that in most cases do less much less that 1% of the work. Also, if religion wants a say in how laws should be made and exactly what they cover then Religions can start paying taxes like the rest of us. How about we focus on the real problems like hunger, poverty, war, healthcare, gun violence, education and stopping the hate. War on women is the same concocted drivel as the impeachment narrative. Bogus cr@p to obscure the endless failures of the chosen one. Sniffit – " The idea that having children early and out of wedlock LEADS to poverty later in life is patently absurd in the face of the evidence that there's a cycle taking place and you simply can't say which came first or caused the other." When children 14 thru 18 are having babies, it is pretty obvious what is happening first. How about the concept that you get out of high school and maybe 2 years more training of some kind, then THINK about having a baby. These are not stray dogs we are talking about, who have no control of their bodies. It is called accountability. Too much of a conservative concept for you too grasp?? I love it when tough talking punks have their yellow streak exposed. I will give Paul credit, he's learned how to tap-dance around his previous statements on this issue very well. I have little doubt that he will embrace all of the traditional GOP stands on social issues if he were to become the nominee, and he would get picked apart like a carcass on the Serengeti by his Democratic opponent after the other GOP candidates wounded him beyond repair. The GOP 2016 convention will make the Democratic convention of 1968 look like a picnic. What about the endless failures of congressional Republicans? Harry Reid let Mitch McConnell introduce his own bills, something which Boehner would never allow Pelosi to do in the House, but McConnell only saw fit to filibuster. McConnell had to filibuster his own bill twice because he was playing political gamesmanship and failed miserably. The debacles in the House since 2011 have been historical. Republicans control the purse strings. We have seen a near credit default, with a resulting drop in our credit rating, when Republicans played political games. They tried to run out the clock, and passed a bill with nearly zero time left on the clock. Not enough time to negotiate a compromise. They pulled the same stunt before the government shutdown. Many of the Republican hard liners were celebrating once the largest government in our nation's history began. Previous shutdowns had always seen a number of appropriations bills passed before the shutdown. In other words, not everything shutdown because appropriations had already been made, but not last fall. The House hadn't even taken up a vote to appropriate anything before the shutdown. Instead of a partial shutdown, we had a complete shutdown. Sen Rand Paul turned out to be another"flip flopping" and "straddling the fence" ambitious politician. Exactly what does he stand for? Looks like he is abandoning his Libertarian principles to pander to the extreme right wingnuts. ....The idea that having children early and out of wedlock LEADS to poverty later in life is patently absurd in the face of the evidence that there's a cycle taking place and you simply can't say which came first or caused the other. Serious question, which do you think came first...the Herp or the Derp? Personally, I think the Derp cam first. I believe you're correct. In the beginning, there was Derpy. Herp only followed when God removed the "y" from Derp and used it to create Herp, so that Derp would not be lonely. "When children 14 thru 18 are having babies, it is pretty obvious what is happening first. " And when the incidence rate of that happening is statistically significantly higher for those in poverty versus those who aren't, those who have college degrees versus those who don't, those who live in certain areas versus those who don't, etc., can you really say that the poverty later in life was BECAUSE "she had a kid at 16"? No, you can't. Why? Because she had a kid at 16 because she was poor...and all that goes with it in terms of lack of opportunities and education and resources, etc...in the first place. The only thing we can be SURE came before the baby was the fun stuff. "How about the concept that you get out of high school and maybe 2 years more training of some kind, then THINK about having a baby." How about the concept that those kinds of opportunities don't really exist and are fought tooth and nail by people in a position to obstruct them?